Dark green vegetables contain the vital nutrients for our overall health. They are also one of the most important foods for maintaining healthy, growing hair. Green vegetables are very rich in iron. Iron is one of the most important nutrients for the hair as it carries oxygen to the hair follicles. Salmon is a good source of Iron. Other iron sources include: liver, eggs, dates, raisins, and whole grain cereals. Your body needs Vitamin A to produce sebum, which is the oily substance secreted by your hair follicles, that keeps your hair and scalp moist. Vitamin A is also important in the prevention of hair loss, this is because it improves your body's ability to handle stress. Vitamin A also strengthens the skin’s protective tissue and helps to flush out toxins. Vitamin C in dark green leafy vegetables is an antioxidant vitamin, which means it helps to protect your hair from free radicals. Free radicals can cause your hair to become brittle and prone to hair disorders. Finally, your body needs adequate amounts of these three nutrients for healthy hair (and skin). 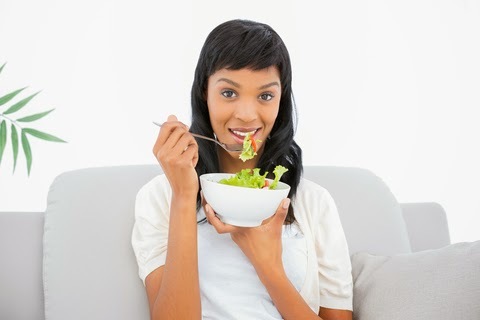 So try to incorporate as much leafy green vegetables into your diet as possible. Visit www.FruitsandVeggiesMatter.gov/ to calculate the amount of vegetables needed, based on your daily caloric needs.